Who said chivalry was dead? Berlin’s Sir Savigny hotel is Amsterdam-based hospitality group EHPC’s first hotel foray outside of the Netherlands, marking the start of a gallantry crusade that includes the opening of new Sir-properties in Hamburg, Amsterdam and Ibiza within the next year. Housed in a former residence from 1893 and located in Berlin’s Westend, a quick stride from Savignyplatz, Sir Savigny gives an air of modern-day aristocracy that treads a fine line between suave and eccentric madness. An arched exposed brick passage covered with German street artist DOME’s figures leads to the hotel’s library. It is here, seated at a large wooden communal table and surrounded by floor-to-ceiling book cases filled with coffee table books and magazines, that guests are checked in while others enjoy a meal or get a chance to catch up on some work. The ground floor’s public spaces, designed by global studio Baranowitz + Kronenberg, also includes a lounge, a green courtyard garden and burger bar The Butcher. 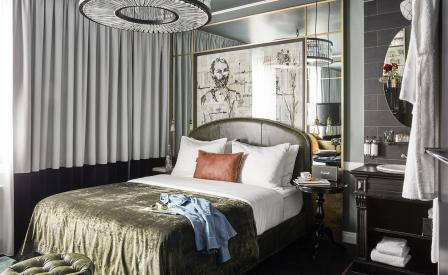 The 44 rooms and three suites, decorated by Amsterdam-based designer Saar Zafrir, feature a full-bodied palette of materials and hues – plush velvets, smooth leathers, rich greys and emerald greens. The madman-like scribble collage paintings found hanging over each bed are by Berlin artist Katharina Musick.